Baryalai “Bari” Popal fled his native Afghanistan in 1980 after the Soviet occupation and only returned after the Taliban was ousted in 2002. 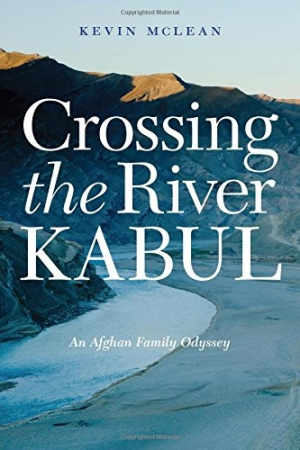 The result of ten years of collaboration, lawyer Kevin McLean’s Crossing the River Kabul: An Afghan Family Odyssey narrates the shifts in Popal’s family fortunes and follows him from Afghanistan to Germany to the United States, and finally back home. Popal and his family descend from the Popalzai, one of Afghanistan’s two royal families, and over the decades they have held great political influence. However, the country has frequently changed hands and allegiances, and the Popals have not always been on the “right” side of history. Whereas Bari’s grandfather was exiled by the “Iron Amir” in the late 1800s, his father, Abdul Rahman Popal (simply called “Baba”), served in the country’s foreign ministry, and Uncle Ali was the ambassador to Japan. During the time that Popal was a student at Kabul University, the Communists came to power. He refused to register with the military and would hide in the chimney crawl space whenever National Security guards came looking for him. In 1980, he and a cousin finally escaped the country via Pakistan. Family connections rescued him more than once, and after a decade in Aachen, Germany, he got his longed-for chance to move his family to America. He purchased a SpeeDee Oil franchise in San Diego, California, in 1992 and became a US citizen in 2002.